It is very rare that an image becomes indelibly imprinted on my memory, but this happened in Venice on my last trip. 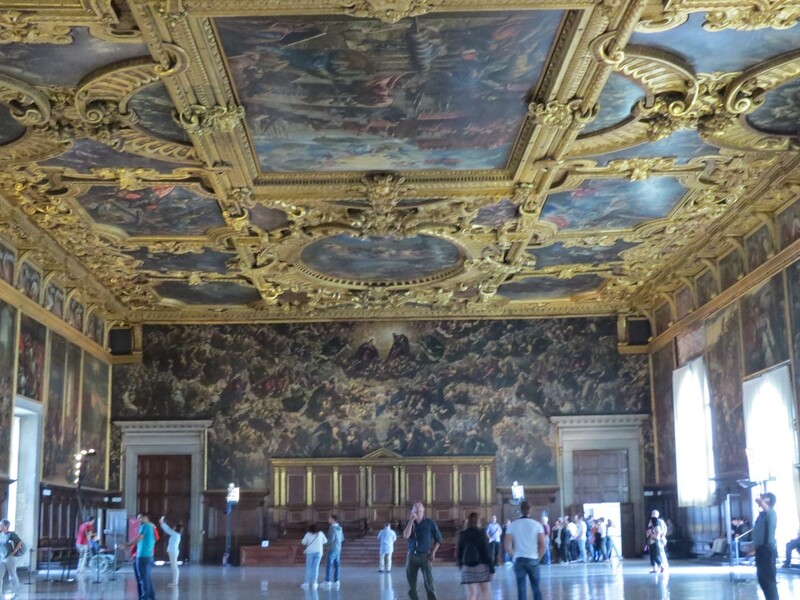 My previous visit to Venice was almost 20 years ago, and this recent trip was specifically to reexamine the work of a select set of artists: the painters Tintoretto, Veronese and Tiepolo and the architect Palladio. In some cases, I would see the works of several at one location. 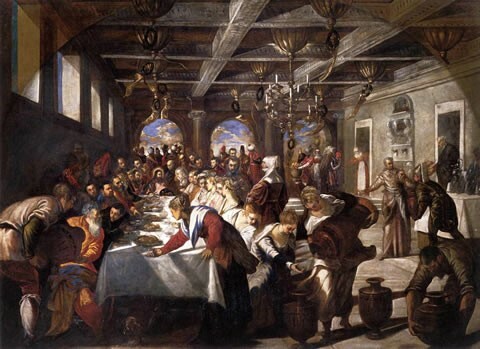 Initially, I had been disappointed with the work of Tintoretto which at times can be aimless excess, but it quickly became obvious that when Tintoretto was presented with a challenge, he could rise to the occasion. 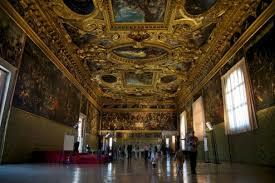 The first time I noticed this was the Il Paradiso at the Doge’s Palace. This was a commission that had initially been awarded to Veronese, but when Veronese died without having started the project, it was awarded to Tintoretto. This painting is a masterpiece, an enormous masterpiece. At almost 82 feet long by 30 feet tall, it is one of the largest canvas painting in the world. It seemed that the times when Tintoretto excelled was when he was competing with Veronese. Although Tintoretto had been Titian’s assistant, Titian favored Veronese, at times openly in public and in competitions. The Tintoretto paintings that impressed me the most were at the church of Madonna Dell’ Otto. Tintoretto and his son and daughter are buried here. 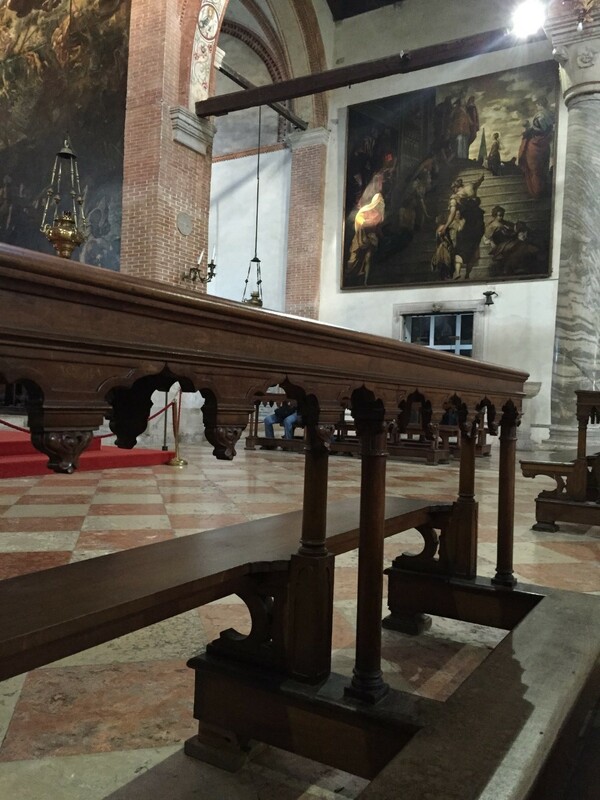 The paintings on the altar are marvelous (at around 50 feet, amongst the tallest canvases ever painted). The largest panels have a massive number of elements and yet the whole image is unified. But, above all, the painting that remains in my memory is “The Presentation of the Virgin” to the right of the altar. Vasari praised the painting as the ‘best executed and happiest’ picture in the church. It was originally painted as two canvases to decorate the outer doors of the church organ, which became a single picture when closed. 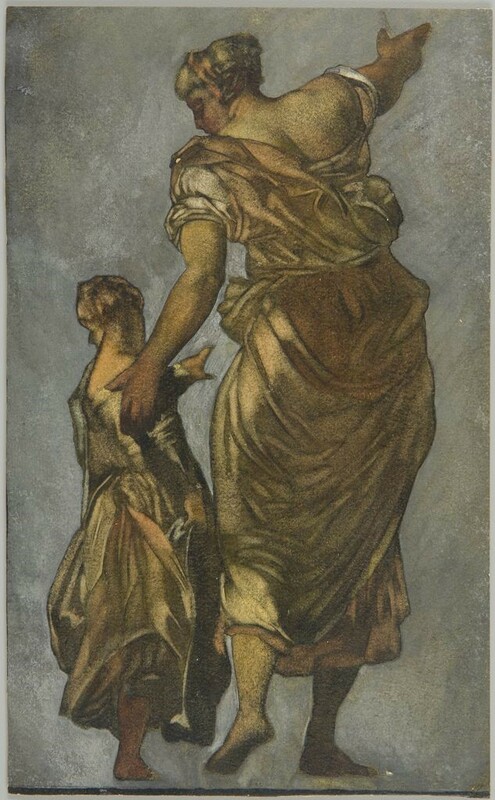 According to a recently discovered account of Tintoretto’s family history (reputedly by his son-in-law Sebastiano Casser), Tintoretto portrayed his daughter Marietta as the child and Marietta’s mother, a German woman with whom he was passionately in love, as St Anne. To accompany the painting, two brilliantly colored pictures by Tintoretto now in the apse, the Vision of the Cross to St Peter and the Execution of St Paul (each 420 x 240), were painted for the inner doors of the organ. What makes this painting so amazing is that it more closely resembles a Veronese in composition than a Tintoretto. Veronese was a superior draftsman to Tintoretto. The whole layout of the painting resembles a Veronese, Tintoretto refraining from his usual addition of extra figures in the wings. One thing that I noticed about Tintoretto is that his paintings are always complete scenes. There is never a feeling that anything is occurring apart from the action shown. 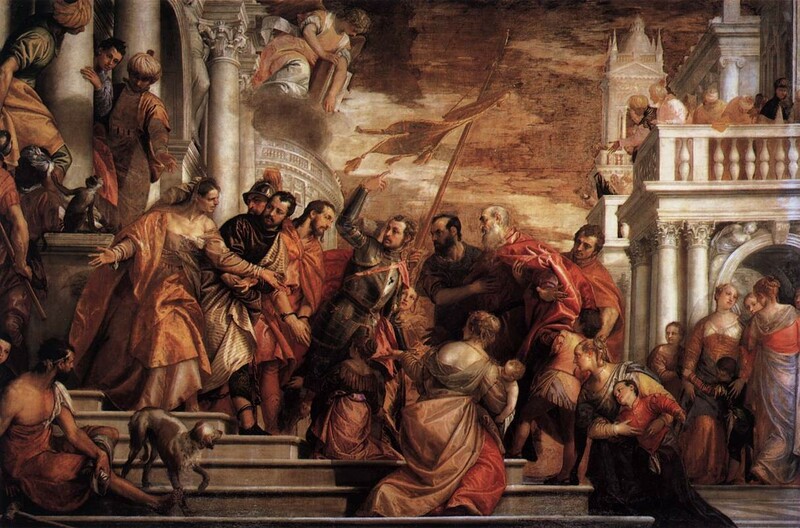 In Veronese, there is a feeling that something else is happening, and this is just a detail from the whole action. Therefore, it is not unusual in a Veronese painting to see cropped figures, or figures partially obscured by architecture. I would have considered that the resemblance to Veronese was just a coincidence, except that I had just seen a painting at the church Santa Maria della Salute called “The Marriage at Canna”. This was a commission for the refractory of the church that had been awarded to Tintoretto on the understanding that it would be painted in the style of Veronese. 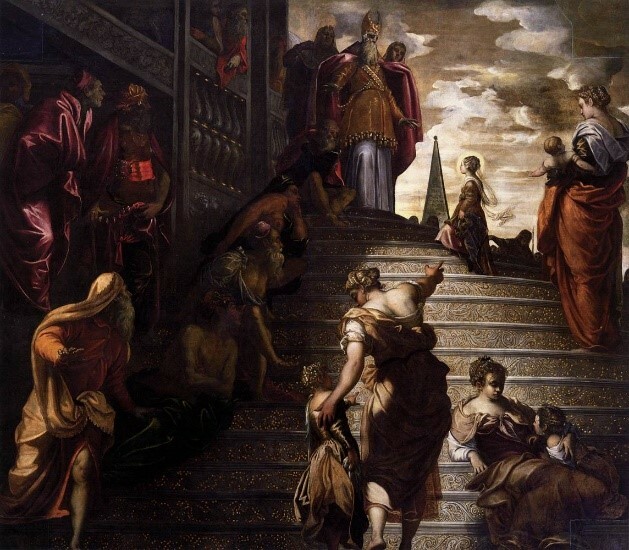 Tintoretto’s “The Marriage at Canna” at Salute and “The Presentation of the Virgin” at Madonna Dell’ Otto not only possess Veronese compositions, but also use Veronese color palate, having a lot less of the pale yellow characteristic of Tintoretto. When you look at the skin color of Tintoretto, it is always pale yellow overall, whereas Veronese only highlights in pale color. The similarity of “The Presentation of the Virgin” to a work by Veronese had not been noticed by just me. There is a drawing in the Fogg Museum by George Hallowell. It is titled as after Tintoretto. It was formerly titled as after Veronese http://www.harvardartmuseums.org/art/306353. The one thing that distinguishes Tintoretto’s composition from that of Veronese, is that in Tintoretto paintings the secondary figures look at the subject directly, drawing the eye to it. But, in a Veronese painting, the secondary figures seem to look towards the subject, but not directly at it, sort of boxing the subject in gazes. This creates a very interesting uneasy gaze whose incompleteness resembles the incompleteness of the composition. It begs the viewer to complete and resolve the image. Tintoretto during his lifetime had a reputation for being overambitious and a bit of a hack as opposed to Veronese. It is interesting that despite his success, Tintoretto still felt the need to compete with Veronese and when he did, he produced masterpieces of equal quality. The other reason for this painting being embedded in my memory was that since I was in Venice in fall and in the church in late afternoon, the light was passing at a low angle through the windows. The light hitting the painting made certain figures glow and as it moved, changed the figure at the center of the composition. This is the joy of seeing painting in their original setting and context. 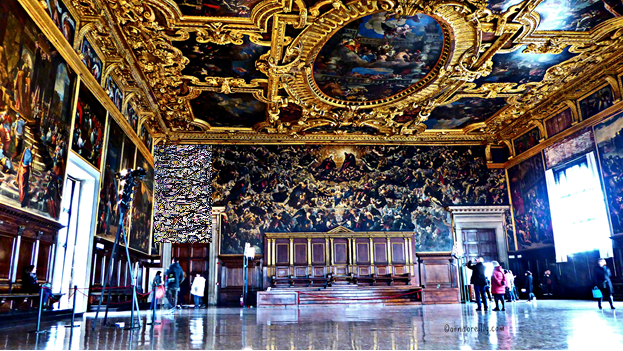 When I saw my first Tintoretto on this visit I was tempted to look at no more, but the “Il Paradiso” in the Doge’s Palace begged me not to abandon my quest. It was ”The Presentation of the Virgin” that satisfied that quest. Of all the art I saw in Venice, it is still Tintoretto’s “The Presentation of the Virgin” that I dream of when I close my eyes.